Get DLF Premium for FREE! We examine the woeful performances of the top rookie receivers in the 2017 NFL Draft. Can they turn things around? In May 2017, these names represented hope and potential. It was just the fourth time since 2000 that three wide receivers were selected in the top ten of the NFL Draft. Dynasty owners followed suit, as the trio sported rookie draft ADPs of 1.01 (Davis), 1.06 (Williams), and 1.08 (Ross) throughout the summer. In traditional startup drafts, all three pass-catchers achieved and maintained top-80 status up until week one of the regular season. Gain Instant Access to this article and much more. Join DLF with a Monthly Subscription or Annual Membership. Or, open a DraftKings account for only $10 and receive a full year DLF PREMIUM FOR FREE! 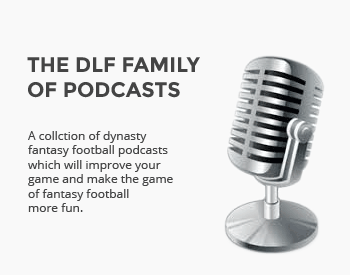 Already a DLF Premium Member? Want more info about DLF Premium? Have questions or need some help? Curtis is a Senior Writer, player ranker, and host of The Player Rater Podcast here at DLF. Other than winning, his primary focuses in dynasty football are player valuation and exploiting the market. Curtis doesn't just manage his own portfolio, he also helps manage and strategize for hundreds of subscriber teams in the Dynasty Command Center, a joint venture with DLF Team Lead, Ryan McDowell. Curtis also publishes redraft and DFS analysis at Pro Football Focus. A healthcare executive by day, Curtis is also a husband, father to three kids, and coach to many. Great article and love the historic context to put performances in context. Given though that all three had extenuating circumstances for Davis with huge drop off in overall offensive production with titans and mariota he would be only one to target. However no one is selling Davis for anything Less than a high 2018 1st round pick and possibly something else. As another DLF writer (I think Ryan McDowell) showed in prior articles, rookies hold value regardless of production for about 2 years after drafted in dynasty leagues. Ross may be wild card to buy on cheap. Only AJ green and eifert competing for targets. But ceiling probably a wr2 at best. Williams is in a crowded receiving corps and I don’t see him getting a large target share with Keenan Allen, hunter Henry and tyrell Williams soaking up volume. Also enjoying the new podcast with Ryan McDowell. Thanks for reading and for the comments Daniel! It is very true that these players will hold value…but amassing value is only part of the equation for winning in dynasty. Production matters, and we shouldn’t be overconfident in projecting what these players will do moving forward. Situational factors abound for each of them but it’s also possible that they end up as busts, hence the wordplay in the title. They are all holds if you own, but I’m not buying unless it’s at a discount rate. Really great piece Curtis! I was thinking all three were buy candidates going into 2018 but now I am definitely second-guessing this approach! Williams and Ross are one thing, but Corey Davis is quite another case IMHO. He seemed to be in a tier of his own among WRs heading into 2017 rookie drafts. Would you agree he is a hold for those who own him? Or would you argue that if you could get, say, a high 2018 1st you would sell at this point? Hi Ryan! I liked Davis and Williams in particular as prospects and believe in their talent. I divested from my only Davis share mid-season when a fanboy brought an offer I couldn’t turn down. I own several Williams shares and am holding him in those spots. I would call all three of these players holds, but would be willing to sell if I can get an aggressive offer. This article was meant primarily to serve as a wake up call that none of these players is a lock to pan out at this point and that going out and buying them certainly comes with a risk that I’m not sure the community is properly weighting into their valuations right now. Sign me up for the DLF Newsletter! Not yet a Premium Member? DLF Trade Analyzer ← New! Our latest tool has arrived - the DLF Dynasty Trade Analyzer! Our DLF staff rookie mock draft continues with a look at round two. Which aging receivers might be about to fall off the fantasy football cliff? Copyright © 2006-2018 Fantasy Sports Enterprises.